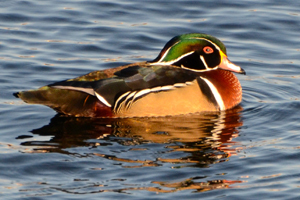 3 – at this time of year during breeding season, they can be almost obscenely beautiful to look at (like this glamorous male Wood duck). Pretty much anyone will quickly warm to looking for ducks as they are easy to find and really stunning. To learn to ID the ducks bobbing around on your local pond, first take a moment to look at what they are doing. 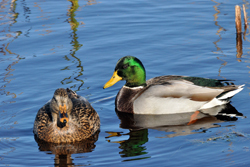 Ducks are loosely divided into divers and dabblers. The divers will disappear underwater for — in some instances — a lengthy period of time and pop up often a fair distance away. These diving ducks may go to the bottom of the pond and grab crustaceans and crabs; others will chase and catch small fish. Dabbling ducks, however, are always on the surface. They extend their beak and look like they are constantly drinking water. But they are filtering off the algae, insects and small grains on the surface of the water. Once you determine whether the duck is a dabbling or diving duck, this will make it much easier to make the ID. And this is a great first observation to start your duck outing with kids or new birders. and ID with the male’s bright yellow beak and iridescent green and violet head. They are often found near, and for new birders can be easily confused with, Northern Shovelers. But no self-respecting Mallard has a beak as long or as black as a shoveler. ID done! on your toes to see them on the surface! 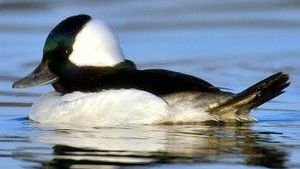 Mergansers are another kind of diver that frequents ponds and spend a lot of time underwater. But most mergansers of have a long thin beak and a nice crest of some sort – from the gorgeous male Hooded mergansers with their stunning black and white graphic crest to the lovely females with their fluffy reddish-brown crest. There are over 30 species of ducks in North America, and ducks are one of the easiest birds to start identifying. Get a bird field guide to take with you, a pair of binoculars, and if you want to have a little fun learning some of the more commonly found ducks and their calls, check out our Wild About Birds! App for your iPhone and iPad. The Lakes and Marshes in-app has sounds, images and info for over a dozen common waterfowl in it – from Mallards and Shovelers to Pied-billed grebe, Blue-winged teal, Common loon, Ruddy duck and many more – as well as a game to help to make the ID.